I wrote last year about the Tom Higgins and the Heart & Hands Wine Company in the Finger Lakes wine region of New York (www.princeofpinot.com/article/1235/ and www.princeofpinot.com/article/1278/). Tom is one of a small group of dedicated vintners making strides with Pinot Noir in this very cool growing region. Along the banks of the Finger Lakes there are sites that are ideal for Pinot Noir, with soils redolent of Onondaga formation limestone and outcroppings of shale. The proximity of the vineyards to the lakes and the gently sloping sites offer vineyards protection from harsh winter weather. The Finger Lakes is on average one of the wettest wine regions in the world during harvest, the biggest threat to winegrowing in this northerly region. Tom is crafting about 1,500 cases annually of exciting Pinot Noir, Pinot Noir Blanc, Brut Rosé, and Riesling at his winery on the shores of Cayuga Lake using grapes from several top winegrowers in the region. Curiously, he vinifies his Pinot Noirs with significant whole cluster (the Barrel Reserve is 100% and the regional bottling is typically 50%) which seems to defy all logic for this very cool region where grapes are typically picked at low Brix. His experience working at Calera Wine Company and sampling many whole cluster wines from the similar cool climate of Burgundy led him to believe it could be done in the Finger Lakes. 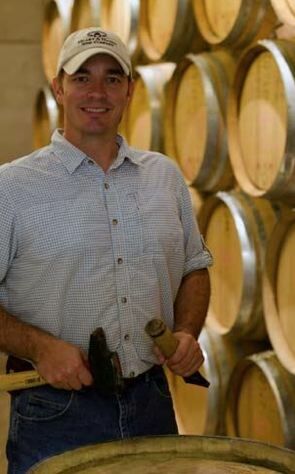 His pioneering efforts in this region have alerted others and in 2012 more that 50% of his Finger Lakes colleagues were incorporating some amount of stem inclusion in their Pinot Noir programs. He has worked with Cornell University for a few years to better understand his stem program. Tom reports that the 2011 vintage in the Finger Lakes had an abundance of moisture in the spring, followed by a warm and dry summer with intermittent thunder storms. Harvest received considerable moisture from two hurricanes. Despite the challenges at harvest, the Pinot Noir wines are aromatically expressive. 2012 offered a mild winter and unseasonably warm March causing a record early bud break. Warm weather continued throughout the summer leading to the earliest harvest on record. 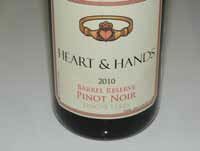 The Pinot Noir benefited from the heat resulting in intense flavors and additional structure. The wines reviewed here must be appreciated in the context of where they originate. The wines are far from the richly endowed Pinot Noirs of California, but they have their own delicate and enduring charm. The use of significant whole cluster fermentation gives the wines a slew of interesting aromas and flavors without any significant intrusion of unwelcome vegetal tones that can be associated with stem inclusion. The tannin structure is also noticeably different. The Pinot Noirs are generally vinified in 1-ton fermenting bins for about 14 days, basket pressed and aged 12 months in 100% Francois Frères oak barrels. All wines are bottled under glass closure (Vino-Seal). Visit www.heartandhands.com for more information.